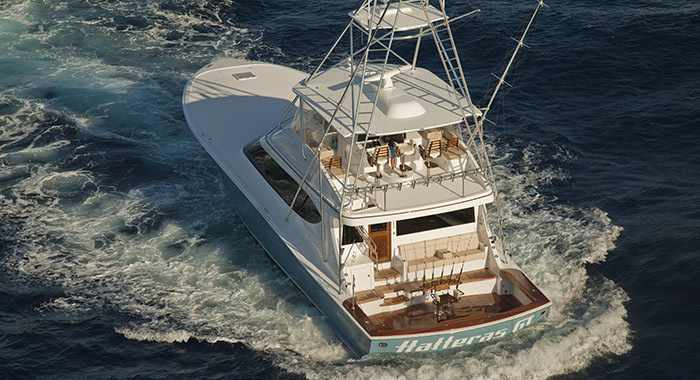 A well-equipped cockpit allows for new levels of fishing and cruising in a best-in-class 200 square feet. Its raised mezzanine has cushioned seating protected by an overhang next to an automatic sliding glass door to the deckhouse. The GT70 delivers a full bait and tackle center, in-deck fish boxes, insulated bait box and mounting plate for a fighting chair. Hatteras knows that space is sacred on boats, so storage is everywhere — in the steps to the deckhouse, and in the lazarrette. If you want to bring it, the GT70 can stow it. 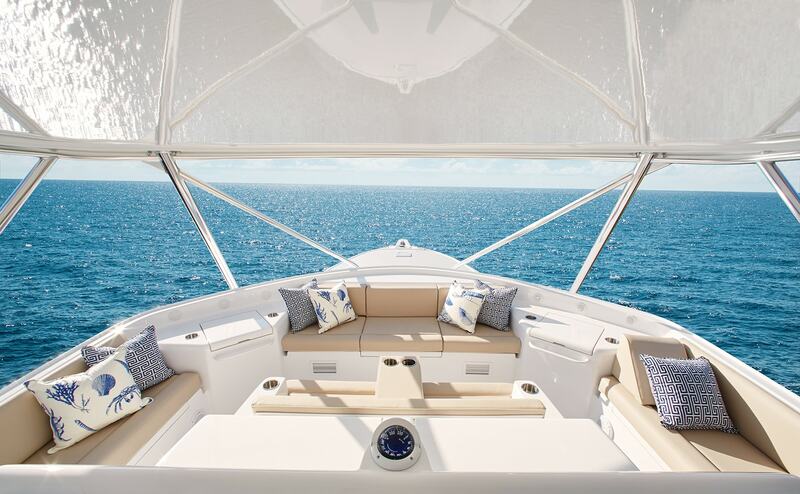 The open flybridge offers a pod-style helm with single lever controls, plus three adjustable helm chairs and three bench seats with reversible seat backs. 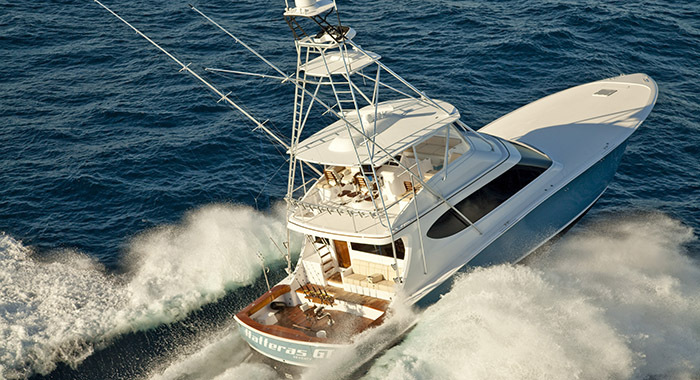 It’s another full featured area from which to enjoy the journey, a journey only found on a Hatteras GT convertible. The GT70 is big and beautiful where it counts — on the inside. Elegant fabrics, finishes and accents achieve a premium level of style and sophistication in the salon, which features a Bose home theater system with 40-inch TV and an L-shaped lounge with rod storage underneath. This space flows seamlessly to a starboard-side dinette with raised seating for six at its high-gloss wood table. A granite island with rotating bar stools, ceramic cooktop, under-counter refrigerator/freezer drawers, and gorgeous cabinets complete the high level of craftsmanship in the galley. Frameless windows all around allow natural light to radiate off the ivory-hued fabric headliner, creating an inviting and comfortable entertaining space. An optional salon day head enhances the boat’s already soaring levels of convenience and hospitality. A wide, teak-paneled staircase curves down to the accommodations below. 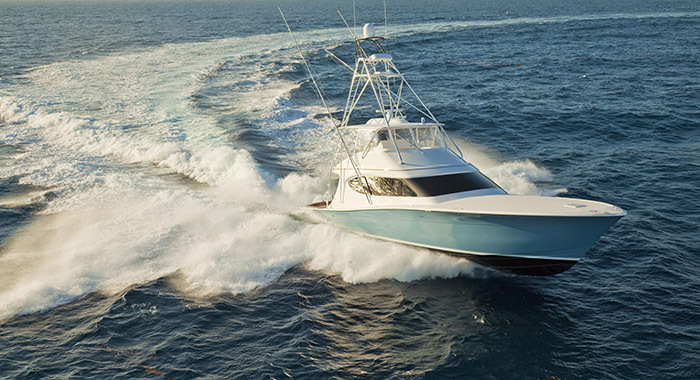 Here the GT70 provides a five-stateroom, four-head arrangement that offers complete crew flexibility. The master stateroom to starboard features a king berth with upholstered headboard and cedar-lined storage beneath. Custom nightstands, a luxurious private head with shower and home theater system with 40-inch TV top the list of amenities — all surrounded by warm wainscoting. A bow VIP stateroom has an island queen berth, 32- inch TV, cedar-lined hanging locker and private head access, along with high-gloss wood cabinetry to create a rich and welcoming ambiance for guests. Port forward and port aft guest staterooms feature over/under bunks and 22-inch flatscreen TVs; the crew quarters also has over/under bunks, as well as private head with shower. For the ultimate in cruising convenience and comfort, the GT70 is quite simply unparalleled.